Treat yourself to a whole week of knitting-focused activities and excursions with Ann Kingstone in Yorkshire, England! We are going to explore the colourwork, lace, and cable knitting traditions of this historic county, with visits to Yorkshire’s foremost heritage centres, fascinating presentations by knitting historians, and superb knitting tuition for all levels of knitting ability, including beginners! The Brontë Parsonage, home of the Brontë sisters. 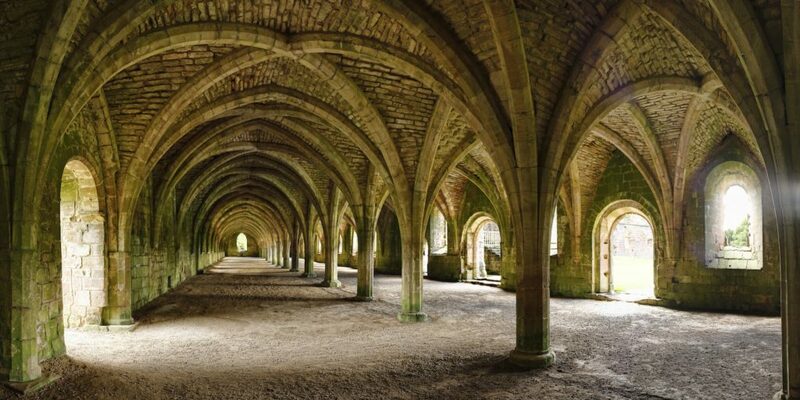 Fountains Abbey, a ruined medieval monastery which is now a world heritage centre. Skipton Castle, a well-preserved medieval fort. 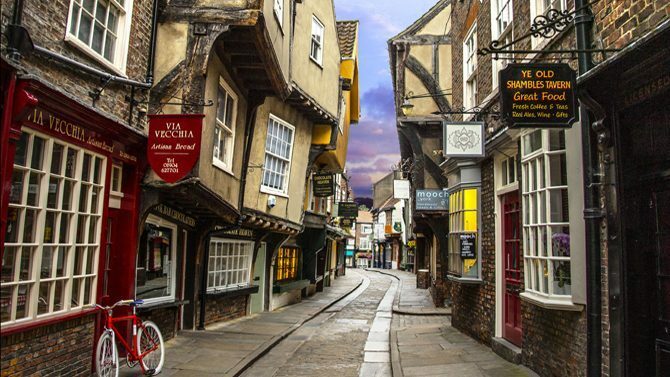 York, the ancient capital of Yorkshire. Dent, the remote rural village of ‘The Terrible Knitters’ of times long gone by. You will also love our home for the week, which is a beautiful Elizabethan manor in Wharfedale, a picturesque Dales valley. Yorkshire has a rich knitting heritage, from the Dales glove tradition, to coastal and inland river ganseys, to Victorian knitted lace. During the week you will meet and learn from experts in these fields, as well as visiting the very places where these traditions were practised. Sunday August 18th: A Yorkshire Welcome! We will transport you to Parcevall Hall from Manchester airport or Skipton railway station, according to your preference. Pick-up at Manchester airport will be at 3pm, pick-up from Skipton Railway station at 4pm. Following an introductory session and supper (aka dinner) the evening will be free for post-travel rest and relaxation. There are very comfortable sitting areas in the Hall that ooze Elizabethan charm and are ideal for social knitting. Alternatively you may prefer to enjoy a walk around Parcevall Hall’s extensive manor grounds, with beautiful terraced gardens and woodland. Stranded Knits Session 1, with tuition from Ann Kingstone. We will commence knitting some colourwork wristlets, which include options for a steeked or an unsteeked version. We will visit Dent, bygone home of the Terrible Knitters. Our visit will include a guided tour of the village centre and a visit to the Dentdale Heritage Centre, a locally run museum and shop. 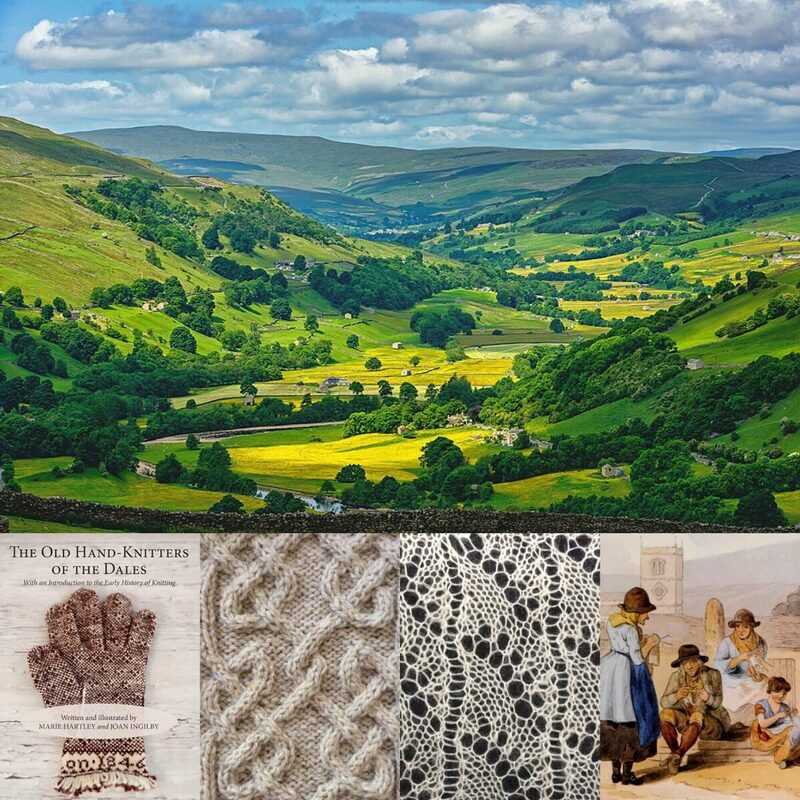 A presentation by Angharad Thomas, a knitted glove historian, about Yorkshire Dales Gloves. Angharad will teach us about the history, character, and construction of these traditional Yorkshire knits. We will have antique and reproduction examples on hand to closely examine. Stranded Knits Session 2, completing the colourwork wristlets, including cutting and finishing the steek for those who have braved this option. A pub lunch at the Craven Arms in Appletreewick, followed by a visit to Skipton Castle. There will then be time for shopping in Skipton’s charming town centre, which includes the delightful ‘Purl and Jane’ yarn shop. ‘Sheaths and Sheep’; A two-part presentation by Ann Kingstone about Yorkshire knitting sheaths and Yorkshire sheep breeds. Lace Knits Session, with tuition by Ann Kingstone. We will knit a lace bookmark. There are several pattern options using stitch patterns from the works of Yorkshire’s Victorian knitting authors. A visit to the Dales Countryside Museum in Hawes (Wensleydale), which was founded by Marie Hartley and Joan Ingilby, writers of ‘The Old Handknitters Of The Dales’. The museum features their collections of antique knitting sticks and Yorkshire Dales gloves, plus other artefacts from the Yorkshire Dales knitting tradition, including ‘clew holders’, sock blockers, and knitting needles. After this there will be time for shopping in the charming town centre, which includes antique shops and a Herdy shop (sheep themed products). A presentation by Marie Wright about Yorkshire’s bygone knitting authors and yarn compaines. A day out in York, home of the early Victorian knitting author, Elizabeth Jackson. We will have a guided tour of York Minster followed by lunch at the elegant York branch of Betty’s Tearooms. The remainder of the afternoon will be free for you to choose what other sights to see and shopping to do in this ancient city. We will provide a tourist map for finding the main attractions. A presentation of Victorian knitted lace from the Knitting and Crochet Guild collection. The guild owns some Victorian knitted lace samplers, which form a knitted record of many lace stitches. We will learn about the history and properties of the samplers, and have the opportunity to examine them in person, as well as many other Victorian lace items from the collection. Cabled Knits Session 1, with tuition by Ann Kingstone. We will commence knitting a cabled pouch, featuring Celtic knot cables. A visit to Haworth and the Brontë Parsonage Museum. The parsonage was home to the Brontë sisters for most of their lives, and it is here that they wrote their novels. Like many Victorian gentlewomen, the Brontë sisters applied themselves to needlework, including knitting and crochet, and some of their work is on display at the parsonage. Like many Yorkshire knitters, they used knitting sticks/sheaths, and several of these have been preserved in the Brontë Society’s collection at Haworth. Our return journey will take us through the Brontë moors. A presentation about the fascinating history and character of Yorkshire Ganseys by Penelope Hemingway, author of ‘Inland River Ganseys’. Cabled Knits Session 2, with tuition by Ann Kingstone. We will learn finishing options for the cabled pouch. A visit to Fountains Abbey and Studley Royal (Wensleydale). This is an official World Heritage Site, with extensive ruins of a medieval Cistercian abbey, landscaped gardens from Georgian times, and a deer park. Yorkshire’s abbeys were central to the medieval wool trade, which was their main source of income. Gannin’ A Sittin’. We will revive the Yorkshire Dales social knitting tradition, enjoying some Yorkshire folk songs. After breakfast and a short concluding session, we will transport you to either Skipton railway station or Manchester Airport, according to your preference. The full price of the tour varies according to your accommodation requirements as follows. Please note that due to the historic character of the building, including spiral stairs, raised thresholds and uneven floors, Parcevall Hall is not suitable for guests with mobility difficulties. Many of the Hall’s bedrooms have two beds, and therefore some of the ‘single’ rooms are for guests wanting sole occupancy. If booking a twin room please give the name of the second person in the notes area of your booking. A twin room with a washbasin and shared bath/shower/toilet facilities = £1650 per person. A single room with a washbasin and shared bath/shower/toilet facilities = £1800 per person. A twin room with en suite bath or shower (not both) & toilet = £1950 per person. A single room with en suite bathroom = £2250 per person. All transportation for the week, including transfer from Manchester airport or Skipton railway station. Admission costs for all scheduled visits. Yarn and needles for the workshop sessions. Lunch at Betty’s Tearooms in York. A pub lunch at The Craven Arms, Appletreewick. A goody bag, including 3 of Ann’s books and some special Yorkshire treats. Our terms and conditions give details of our cancellation and refund policies, and of general requirements pertaining to the tour, including the deadline for payment of the balance. We are so excited as we look forward to welcoming you to our beautiful county and sharing with you the special delights it has for knitters! Will you be flying in for the tour? We recommend Skyscanner for finding flights from an airport near you to Manchester Airport. Skyscanner compares millions of flights to find the best deal for you, fast. What a fantastic week my friends and I had on this tour led by Ann Kingstone! She and her sister Marie pulled out all the stops to make us feel so welcome:) Everything was meticulously planned, and they obviously put so much time and effort into the endeavor. We were well-fed, entertained, and taught new skills each day. The afternoon tours were great, too! I would highly recommend this amazing tour for lovers of knitting and history!! This week was simply fabulous! Ann and her sister Marie are so much fun and really planned the entire week down to the very last detail. Parcevall Hall was charming and the view out of my room was stunning. All of the meals at the Hall were beautifully prepared and delicious. We saw many memorable sights and learned so much about the history of Yorkshire knitting. We made new friends and I think we were all sad to see the week end. of friends. The goodie bags we received, were out of this world, and much appreciated. We learned something at every opportunity, Ann and Marie shared, the love they have of knitting , history and the Yorkshire countryside. Parceval Hall is a hidden gem, an interesting building with beautiful gardens, spectacular view, and a not so scary ghost! (If you can find him). Our bus drivers were both fun and informative, as we meandered along the narrow lanes on our trips out. A wonderful week that we didn’t want to end . I agree with other participants’ rave reviews. Ann & Marie share their enthusiasm for local history and culture, especially knitting. The instruction, the field trips, the treats, the lodging and food were all wonderful. My previous ten years in Britain did not prepare me for the warmth of this Yorkshire welcome! This was my first experience of a knitting tour, but those participants who had done one before said how enjoyable and well-organised this was. Yes indeed a truly wonderful week. Ann and Marie’s love of sharing all their knowledge of knitting and history of the Yorkshire Dales. Came shining through at every opportunity. A most wonderful week. We learnt lots, went on great trips in the beautiful Yorkshire countryside. Ann and Marie planned this meticulously. There was nothing I could fault and would highly recommend it.